STARTS TODAY: Free Chronic Lyme Online Summit 3! The FREE Chronic Lyme Disease Summit #3 is starting today! You can watch the whole thing online, free of charge. Be sure to register and watch this great event, with dozens of top speakers! Affiliates are always welcome. Help us to help others. [Chronic Lyme Disease Summit #3] You need to know about this free online summit! We are excited to announce that registration is now open for the Chronic Lyme Disease Summit #3. It’s taking place online and FREE from April 30th – May 9th, 2018! Lyme disease is often overlooked, misdiagnosed, and is very difficult to treat. The host of this summit, Dr. Jay Davidson, knows this firsthand as his wife, Heather, almost lost her life to this devastating illness. That is why he is now sharing the natural, holistic solutions he found while helping to save Heather’s life. 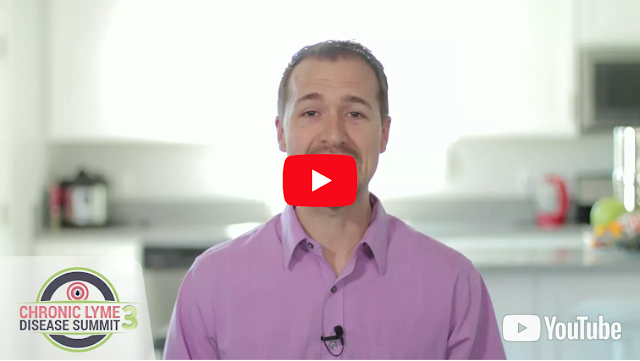 These are also the same solutions and expert opinions he uses to help thousands of clients in healing their Lyme disease and other misdiagnosed chronic illnesses. This is an online summit you can watch from anywhere! Dr. Jay Davidson will interview Lyme disease and holistic wellness experts from all over the world as they share their knowledge with you. The best part is that they’ll be giving you immediately implementable tools and strategies that could radically improve your life or the life of a loved one. Just to name a few of the INCREDIBLE expert speakers that will be interviewed during the summit: Dr. Dietrich Klinghardt, Dr. Sarah Ballantyne, Dr. Richard Horowitz, Dr. Robert Rowen, Dr. Eric Zielinkski, Dr. Jill Carnahan and MANY more!! There will be almost 40 speakers at this year’s event!! P.S. You can join the Chronic Lyme Disease Summit Discussion on Facebook here! Affiliates are always welcome to join. We’d love to have you join us as an affiliate partner for these amazing summit events. Affiliates are influential persons who promote our events/community for commissions, like bloggers, speakers and health professionals. Your audience will absolutely love the content and together we’ll be changing the world and you’ll receive cash for your efforts. You help us to help others too. These summits and docu-series are your connection to improved health. Remember, knowledge is power! 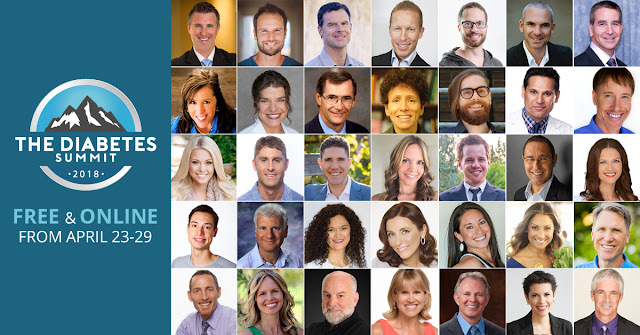 Help others by spreading the word about these amazing online summit events. Become an affiliate for the Chronic Lyme Disease Summit 3! Did you know that toxins, including environmental pollutants and chemicals, as well as EMFs, can cause insulin resistance and diabetes? Today’s Diabetes Summit experts share their vast knowledge to address this topic! 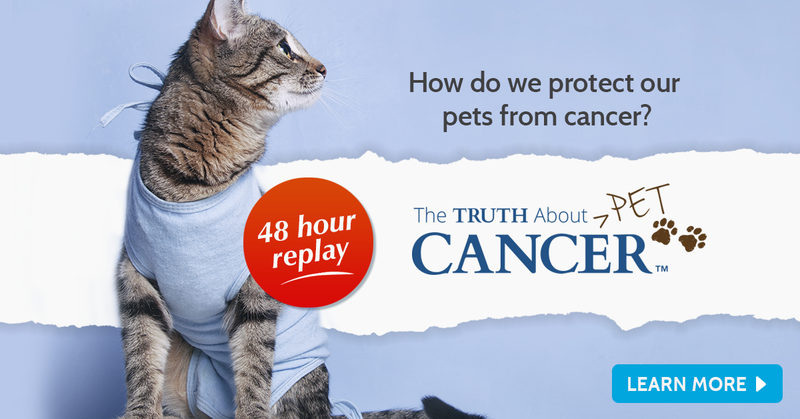 [LEARN TODAY] Toxins, environmental pollutants, chemicals & EMFs – they CAN cause insulin resistance and diabetes! 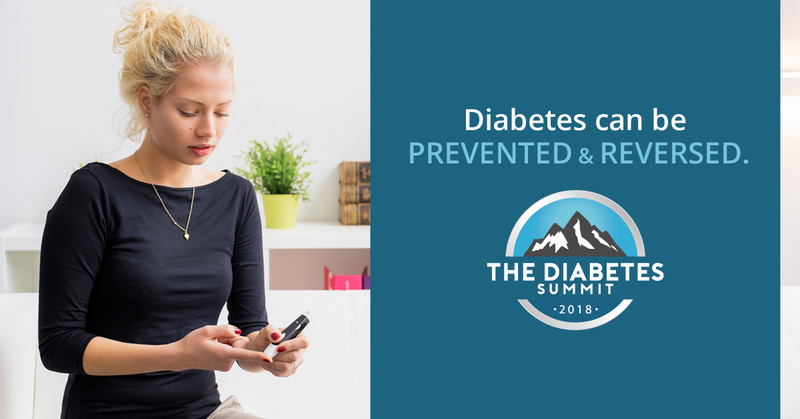 Today at The Diabetes Summit, we’re finishing strong with seasoned clinicians who will help you apply what you’ve learned this week — to find and correct the root cause of type 2 diabetes. Enjoy learning! [LEARN TODAY] Today, seasoned clinicians will help you apply what you’ve learned this week! Join us as an affiliate for Dr. Mowll’s Diabetes Summit! And add this diabetes event to your promo calendar! Join us in promoting The Diabetes Summit 2018, taking place April 23-29, 2018! 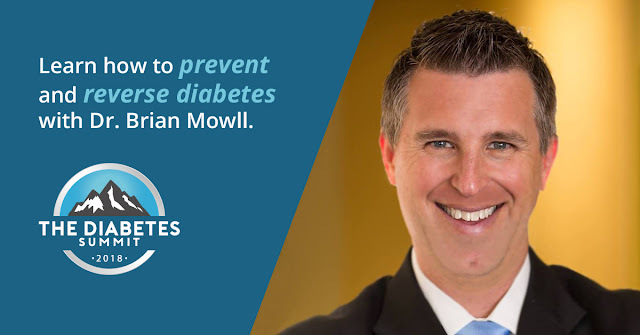 The incredible Dr. Brian Mowll has gathered an expert lineup of speakers to teach your fans and followers how to prevent and revers type 2 diabetes with the right lifestyle changes and strategies. AND, you’re also set as an affiliate for all their upcoming events, including the commission lead for their new monthly subscription community, HealthMeans, and any of their events for the lifetime of the account, including such 2018 topics as Alzheimer’s, thyroid disorders, pregnancy health, home detoxification, candida and more! [The Diabetes Summit 2018] Day 5: Today’s Experts Share How to Optimize Diet, Physical Activity & Lifestyle to Improve Blood Sugar! When it comes to supporting diabetes and health (and understanding what works! ), nothing beats experience. Today’s Diabetes Summit experts share what they’ve learned from self-experimentation, and working with thousands of patients and clients to optimize diet, physical activity and lifestyle factors to improve blood sugar. [LEARN TODAY] Today’s experts share how to optimize diet, physical activity & lifestyle to improve #bloodsugar! Often times, natural health advocates think differently than conventional doctors. 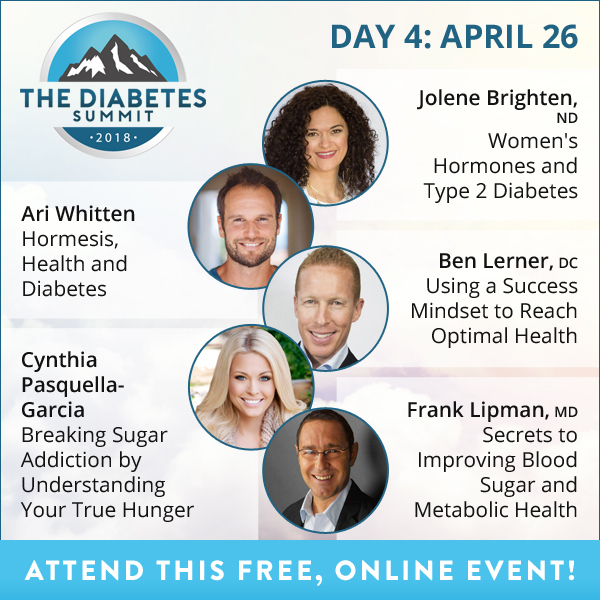 Today’s Diabetes Summit experts share unique approaches to blood sugar and health, including addressing hormones, understanding positive aspects of stress and creating a mindset for success. [LEARN TODAY] Unique approaches to #bloodsugar and health, #hormones, #stress and creating a mindset of success. 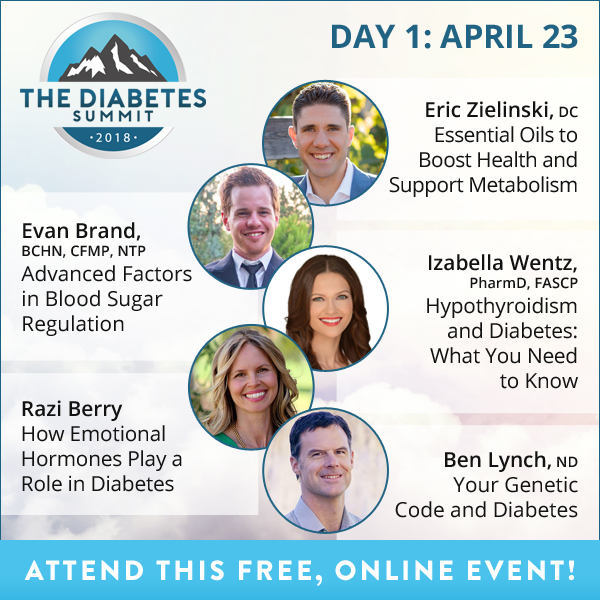 Today’s Diabetes Summit speakers are experts in using various natural approaches to support metabolism and optimize blood sugar. Tune in to learn about the Paleo and Ketogenic diets, gut healing, essential oils and a loving, nutritional approach to create optimal health. 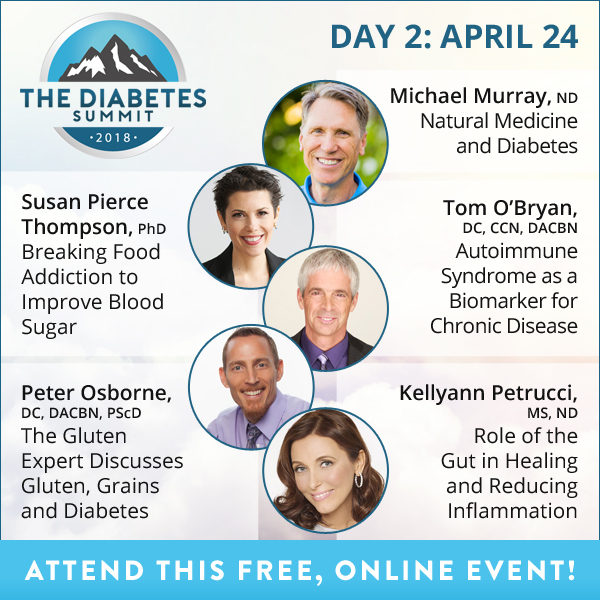 [The Diabetes Summit 2018] Day 2: How to heal the gut to reduce inflammation, protect the brain & boost metabolic function! The gut and brain are central to metabolic health. 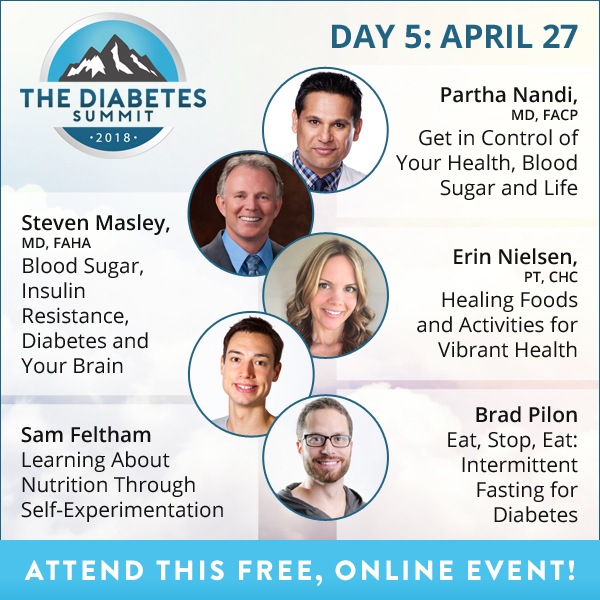 Today at The Diabetes Summit, learn about the power of food addiction and how to heal the gut to reduce inflammation, protect the brain and boost metabolic function. Struggling with metabolic syndrome, pre-diabetes or type 2 diabetes? Attend The Diabetes Summit 2018 to learn the root causes of diabetes and blood sugar problems; the connection between blood sugar and your brain, gut, immune system, heart, hormones and weight; natural solutions to fixing underlying imbalances; emerging research on environmental toxins, EMFs and other factors; how to protect your heart, kidneys, eyes, brain and sexual function and more! 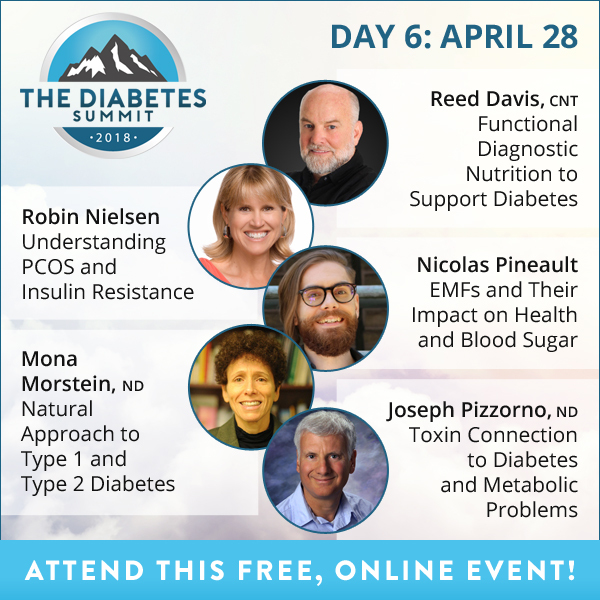 All reasons to attend Diabetes Summit 2018, online and free from April 23-30, 2018! [LEARN TODAY] How to #healthegut to reduce #inflammation, protect the brain & boost metabolic function! What causes the body to attack itself and how can we detect this? Does metformin do more harm than good? [The Diabetes Summit 2018]: Welcome to Day 1! The Diabetes Summit 2018 started today! If you want to reverse type 2 or pre-diabetes, you MUST address the root cause. Today’s speakers reveal a variety of factors associated with blood sugar problems, including gut health, genetics, emotional factors and hormone imbalances.! Learn with us today online for free! Diabetes is a deadly disease, but it can be prevented and reversed with the right lifestyle changes and strategies — so why is it completely misunderstood and mismanaged by conventional medicine? 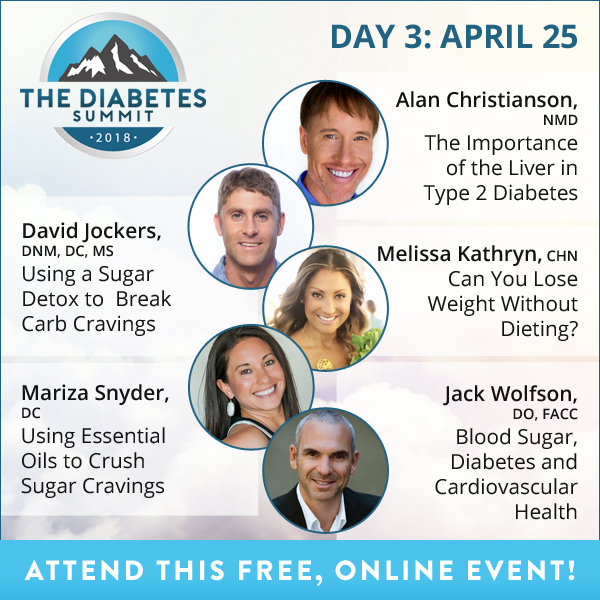 Be sure to catch The Diabetes Summit 2018 from April 23-30, free and online! If you want to reverse #type2diabtes or #prediabetes, you MUST address the root cause! Improve relationships and feel more connected… for health! How important is your genetic code to for diabetes? P.S. Health Talks Online runs 15-20 summits per year, plus their new subscription community is growing quickly. Get started earning commissions with them when you promote The Diabetes Summit 2018 today! [Affiliates] Add this diabetes event to your promo calendar! 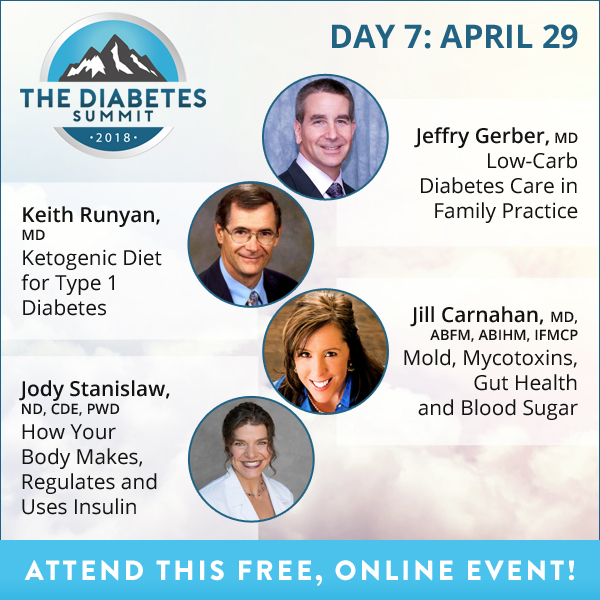 Join us as an affiliate for Dr. Mowll’s Diabetes Summit! Plus, this event is taking place on the Health Talks Online / HealthMeans platform, which regularly returns $2-4 EPLs for top affiliates who promote prior to the sales push, and pays out more than $1MM in commissions each year. AND, any new leads you deliver to a Health Talks Online event means you’re also set as the commission lead for their new monthly subscription community, HealthMeans, and any of their events for the lifetime of the account, including such 2018 topics as Alzheimer’s, thyroid disorders, pregnancy health, home detoxification, candida and more!